The pictures I took of the Awaroa Inlet are the ones I keep as my desktop at work and the ones I took with my memory fill my mind whenever I'm seeking escape and peace of mind. One of the things I wish I knew while planning our time around Abel Tasman National Park is the wonderfulness that is the water taxi system. There aren't a whole lot of accommodation options within the park. You could reserve a camp site, hope for a bed in a hut, find a bach (a small holiday home) to rent, or stay at a rather expensive luxury lodge (ya, that one where I was glutened and received some very poor customer service). By contrast, we loved our cottage rental just outside of the park in Kaiteriteri - just down the road from a water taxi pick up spot. My recommendation for lodging is to either find a bach rental within the park or a cottage just outside of it - taking daily water taxi rides to explore different parts of the park. If you love being on the water as much as I do it should make your days just that much more fun. I particularly loved embarking and disembarking in knee deep water. Cruising around the park, the water taxis will give you a great tour of beautiful rock formations, shorelines, and local wildlife. It's basically a ride and a tour combined - pretty good deal if you ask me. One of the first stops for water taxis in the park is Torrent Bay. Dotted with a number of bachs, the remnants of a small village pre-dating the establishment of the park, it's one of the more bustling spots. There are a number of beautiful coves, beaches, and tiny islands around the bay making it a beautiful spot to kayak and explore. Also, at least during the time of our visit, water taxi landings were made fairly far out from the beach due to the shallowness of the bay. So be prepared to walk through at minimum knee height water as you make your way towards the shore. Another stop along the water taxi route is the much smaller Bark Bay. A popular route, we hiked the section of the Abel Tasman Coast Track from Torrent Bay with Bark as our pick up spot. It's a great place for a picnic and a swim. The landing beach for the aforementioned luxury lodge (the one where I got glutened and had terrible customer service), Awaroa is breathtakingly beautiful. With golden sands, crystal clear water, and plenty of room to wander. 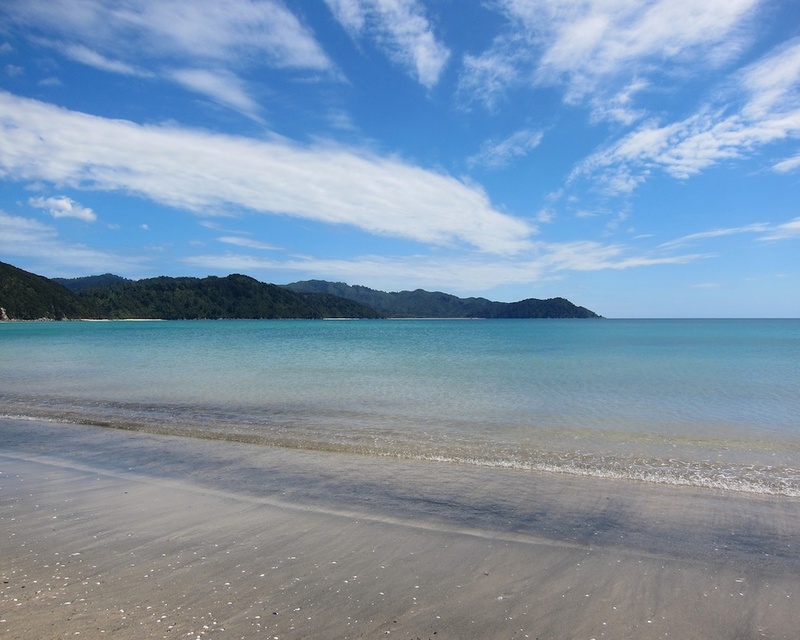 Finally, inland from the beach is my favorite spot in Abel Tasman - the Awaroa Tidal Inlet. This is the stuff my dreams are made of. No seriously - this is my happy place. It's where I go in my mind when I'm in need of serenity. The potential for beach combing and exploring is endless during low tide. Just keep in mind that eventually, the water will come back up - so you might be getting your feet wet on the way back!